Note: Documentation for installing license files issued for versions prior to 5.0 can be found here. This document describes the ways of installing licenses to PC i.e. desktop applications. This way the license is installed for the current user only. For installing licenses on servers, please refer to this document instead. Choose "Licenses..." from the Help menu of any ChemAxon application. The Start menu on Windows: Start->Programs->ChemAxon contains several packages. You can find the same CLM in any package. Launch using the license shell script (Unix) or license.bat batch file (Windows). The licenses are usually stored in the license.cxl file which you receive from ChemAxon. You don't need to open or edit the content of this file, just simply save it to an arbitrary location of your file system. Select the location where you have saved your license.cxl file. 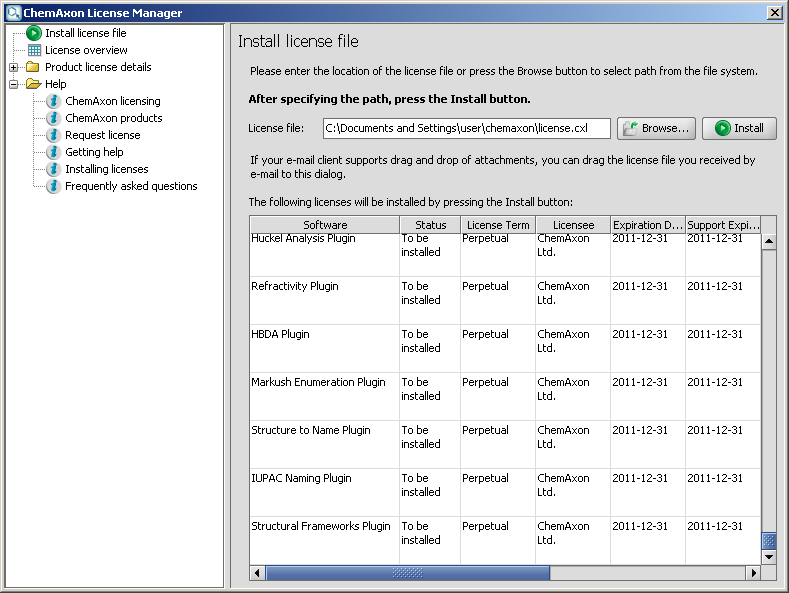 Installing licenses is complete, you will see a license overview where you can see the installed licenses. You can overview your licenses any time by selecting the "License overview" panel. From version 5.3.2 it is possible to define multiple license files of arbitrary locations. The separator character is ";". In case license files are set this way, the license files will be read from all locations defined by the environment variable, the Java system property and from the user's home directory. Launch the license shell script (Unix) or license.bat batch file (Windows). Type license -h for the list of available options.